Stanford Graduate School of Business is back at the top of the FT Global MBA ranking and two-year programmes occupy nine out of the first 10 places. Insead’s one-year MBA, top for the past two years, falls to second place. While there are some variations, the overall number of enrolled students at FT-ranked schools in the US in 2017 has remained stable at about 12,000. A little more than half of schools enrolled more students last year than in 2016. A majority of US schools have recruited fewer international students, but the average proportion for ranked institutions is down by only one percentage point to 38 percent. This is the second time that Stanford has headed the ranking, six years after it first topped the table. Its alumni led the way thanks to a significant salary boost, up nearly $20,000 to $214,000. This is the highest average salary (not adjusted for inflation) since the inaugural ranking in 1999. Despite the school being in Silicon Valley in California, a third of alumni work in corporate finance. “Hedge funds pretty much hire from the top three US schools only [Harvard, Stanford and Wharton]. I simply wouldn’t have been able to land the job I have without Stanford,” said one graduate who was a consultant prior to his MBA. Stanford was also praised for its focus on personal development. “It was a transformative experience with maximum development of intra- and interpersonal skills,” said another graduate. More than a quarter of the latest graduating cohort did an internship abroad, the highest among ranked US schools, where the average is 4 percent. The school is 32 overall for international course experience. Asian schools shone in the 2018 ranking. 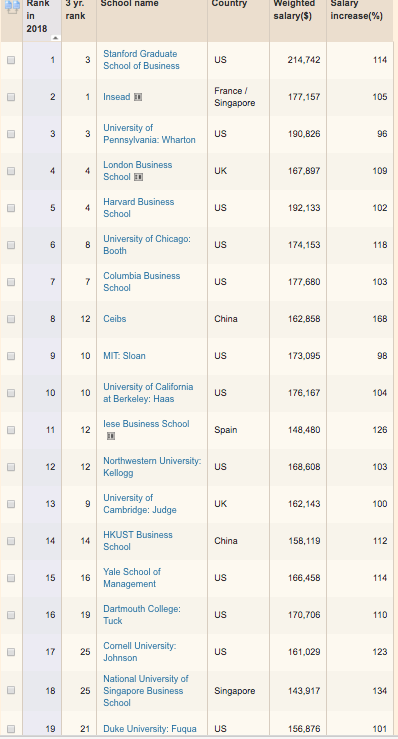 Ceibs, based in Shanghai, is back in the top 10 in eighth place. The National University of Singapore Business School is up eight places to 18, its best performance. Renmin University of China School of Business is back at 39, up four places from 2015. Finally, Lee Kong Chian School of Business became the third-ranked school from Singapore and the highest new entrant at 49. Alumni who graduated from Harvard and LBS in 2014 have higher average salaries three years on than the previous cohort (both up by about $14,000 to $192,000 and $168,000 respectively). However, the schools’ research ranks have dropped significantly — Harvard’s from third to 16th and LBS’s from 12 to 27. This contributed to Harvard’s fall to fifth in the overall MBA ranking. The school had been ranked top for research 12 times, more than any other school, and its lowest previous rank was fifth in 2000. This year’s research rank is based on articles published in 50 academic and practitioner journals by full-time faculty since January 2015, but several Harvard faculty last appeared in these publications in 2014, too long ago to count. Stanford Graduate School of Business is back at number one six years after it first reached the top. Its alumni from the class of 2014 have this year’s highest average salary three years after graduation, at $215,000. This is up 114 per cent on their pre-MBA salaries, which was also the highest increase among ranked schools. The school is ranked fourth for career progress. “Stanford’s MBA enabled me to land my two jobs post-graduation and get much better positions than otherwise,” said one graduate. Ceibs (the China Europe International Business School) is a relatively new institution, co-founded by the Chinese government and the EU in 1994. Nonetheless, it has featured in this ranking continuously since 2002, when it entered at 92. HKUST Business School is the only school from Asia to appear more often (18 times versus 17). 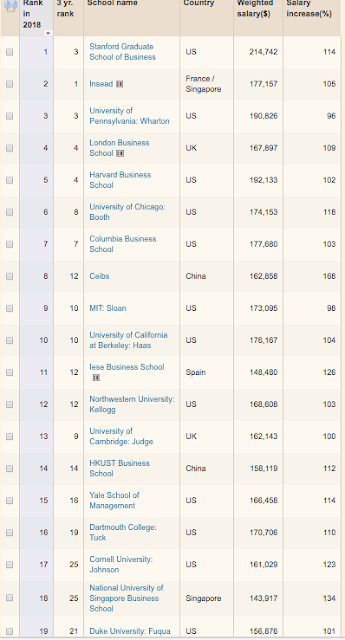 Ceibs moves up three places to eighth, its best performance. This is its return to the top 10 since 2009. A record 15 Asian schools are ranked in 2018. The International Institute for Management Development based in Lausanne, Switzerland, is better known under its acronym: IMD. It is an independent institute specialised in executive education — it has been ranked number one for open-enrolment training since 2012. The school has one of the most internationally diverse MBAs, with 96 per cent of faculty and 99 per cent of students from overseas. Its alumni are also the most mobile: four-fifths have worked abroad at some point in their careers so far. Jones Graduate School of Business at Rice University in Texas is this year’s highest riser, moving up 19 places to 45. This reverses falls of nine and 10 places the previous two years. Alumni from the class of 2013 have an average salary of $139,000, up $8,000 compared with the previous cohort. The salary rise from pre-MBA levels also increased by 21 percentage points to 118 per cent. The school’s MBA has been ranked continuously since 2000 in a range of plus or minus 15 places around the halfway point. Lee Kong Chian School of Business at Singapore Management University enters the ranking at 49, the highest of four newly ranked MBAs. The other new entrants are all from Europe. LKC is the third school from Singapore to feature in this ranking. This comes 18 and 12 years respectively after the National University of Singapore Business School and Nanyang Business School but LKC is gaining fast. The three schools have very similar levels of gender and international diversity for both faculty and students. Hough Graduate School of Business at the University of Florida is back in the ranking for the first time since 2011, reaching 58, its highest position. The school is top in value for money despite alumni’s average salary being in the bottom fifth of ranked schools at $106,000. However, the 16-month MBA has one of the lowest total tuition fees at about $30,000, as well as one of the lowest opportunity costs thanks to being the shortest programme on average in the US. Merage School of Business at the University of California is the first business school in 20 years of FT MBA rankings to have a majority of female faculty, at 52 percent. This compares with an average of 28 percent for ranked schools. The school, which has been ranked continuously since the inaugural listing in 1999, has seen its proportion of female faculty increase steadily year-on-year from 30 percent 20 years ago. However, the proportion of female students has remained almost unchanged at 30 percent. Lancaster University Management School has suffered this year’s biggest drop, falling 28 places to 70. The school was ranked 35 two years ago. Its alumni from the class of 2014 had one of the biggest falls in salary compared to the previous cohort, down $10,000 to $104,000, three years after graduation. Most other ranked schools have higher salaries than in 2017. The salary rise from pre-MBA levels was six percentage points lower than in 2017. Copenhagen Business School is the first Danish school to make the FT MBA ranking. “CBS has a fantastic programme, particularly for more mature professionals who want to develop,” said one graduate. The school made it into the ranking despite the smallest salary ($91,000) and smallest salary boost from pre-MBA levels (up 44 percent). Its latest cohort has 41 percent of women and 93 percent of international students.